“St. 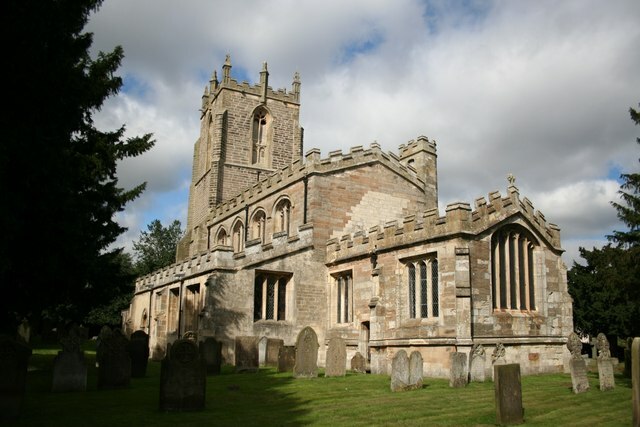 Peter’s Church, Gamston,” 2007, Gamston, Nottinghamshire, England; Wikimedia Commons, copyright Richard Croft. 1 Gamston, County of Nottingham, England, marriage of John Fenton and Ann Bouskill, 14 April 1840; General Register Office, Retford. John Fenton of Bole was the son of John Fenton, shoemaker; Ann Bouskill of Gamston was the daughter of John Bouskill, cottager. 2 Paul Joiner, “The History of Parish Registers,” Joiner Marriage Index (http://joinermarriageindex.co.uk/history-of-parish-registers : accessed 11 August 2014). 3 “Year 1840 Calendar – United Kingdom,” Time and Date (http://www.timeanddate.com/calendar/ : accessed 11 August 2014). 4 Gamston, County of Nottingham, England, marriage of John Fenton and Ann Bouskill, 14 April 1840. 5 William White, History, Gazetteer, and Directory of Nottinghamshire (Sheffield, England: William White, 1832), 371; digital images, Google Books (http://books.google.com : accessed 11 August 2014). 6 “Church of St. Peter, Rectory Lane, Gamston, Bassetlaw, Nottinghamshire,” Images of England (www.imagesofengland.org.uk/ : accessed 11 August 2014). 7 William White, History, Gazetteer, and Directory of Nottinghamshire, 371. 8 William White, History, Gazetteer, and Directory of Nottinghamshire, 331. 9 1841 England census, Nottinghamshire County, England, population schedule, Worksop, p. 11, John Fenton; digital image, Ancestry.com (http://www.ancestry.com : accessed 11 August 2014), citing National Archives, London. 10 William White, History, Gazetteer, and Directory of Nottinghamshire, 455. 11 William White, History, Gazetteer, and Directory of Nottinghamshire, 455. 12 1850 U.S. census, Summit County, Ohio, population schedule, Stow, p. 931 (penned), dwelling 33, family 52, John Fenton; digital image, Ancestry.com (http://www.ancestry.com : accessed 11 August 2014), citing National Archives microfilm M432, roll 732. This entry was posted in Wedding Wednesday and tagged 1840s, England, family history, Fenton, genealogy, marriage, Nottinghamshire, wedding on August 13, 2014 by Melanie Frick. I like the way you presented this post from the viewpoint of the parishioners and young married couple. It’s hard to imagine them, as newlyweds, traveling on foot to a new town, carrying all their possessions. But then, as newlyweds, they probably didn’t have too many possessions yet, if they hadn’t already set up housekeeping. Good post. Thanks, Nancy! It was interesting to find such vivid descriptions of the area where they lived.